Every party has one of those guys. He can be found serenading a group of mortified girls with a horrible rendition of One Direction's hit song, "What Makes You Beautiful," or sometimes he's in the backyard picking a fight with a tree for absolutely no reason at all. Other times he can be giving his philosophical views on why cheese puffs are an overall more satisfying snack than cheese balls. Every party has one of those guys and by golly, every great party needs one. By the end of the night, that guy is usually infamous and he's made an impression on everyone. It doesn't matter whether it's a good or bad impression as long as you're the one everyone is talking about it in the morning. This product functions as a (very) unique belt. It's adjustable so party dudes of all shapes and sizes can sport it. 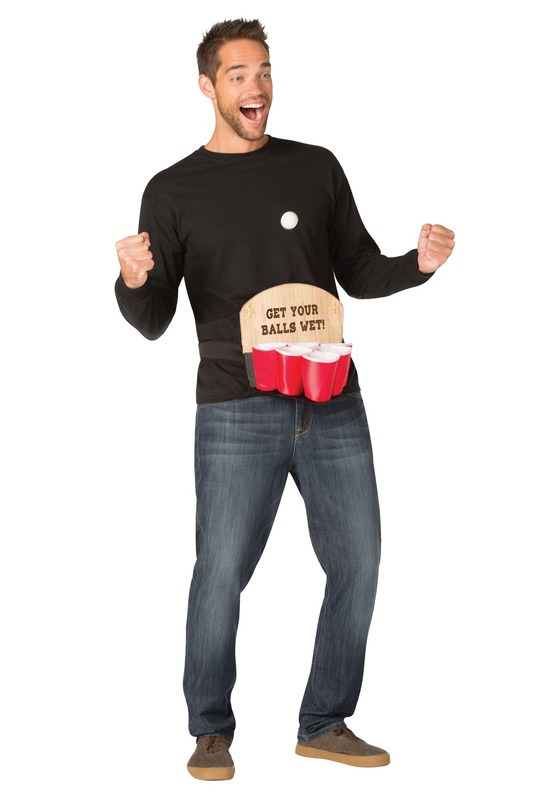 The belt is a comfortable strap with an attached board and famous red solo cups. Go ahead and fill them up with liquid and play for real because you'll also receive a lightweight pong ball. Well bud, we'd love to hear all about the shenanigans triggered by this very costume so leave a review on the product if you happen to remember the events of the party come morning. Be prepared to go down in party infamy as that guy because being famous isn't easy. At least that's what we hear, anyway.